South Carolina legislators voted overwhelmingly to remove the Confederate battle flag from the monument on capitol grounds. All amendments to the proposal were defeated in a 15-hour debate, and the 94-20 vote took place shortly after 1am local time. Governor Nikki Haley signed the bill Thursday afternoon. The flag will be removed at a ceremony scheduled for 10 am Friday morning, and sent to the state’s Confederate Relic Room. “It is a new day in South Carolina, a day we can all be proud of, a day that truly brings us all together as we continue to heal, as one people and one state,” Haley said in a statement. The proposal to remove the flag from public spaces sailed through the state Senate earlier this week, with amendments being taken off the floor and the final measure approved 37-3. The House, however, considered some 60 amendments to the bill over the course of Wednesday’s session. According to accounts from the statehouse, a pivotal moment in the debate was the emotional speech by Republican lawmaker Jenny Horne, who called the flag a “symbol of hate” and said that letting it fly for one day more was adding “insult to injury” to the widow and children of the state senator killed in the Charleston church massacre last month. The National Association for the Advancement of Colored People (NAACP) saluted the decision, saying it was a vindication of the organization’s 15-year campaign to bring down the flag. “This decision will make South Carolina more welcoming and affirming of all people irrespective of their skin color,” NAACP President & CEO Cornell W. Brooks said in a statement. 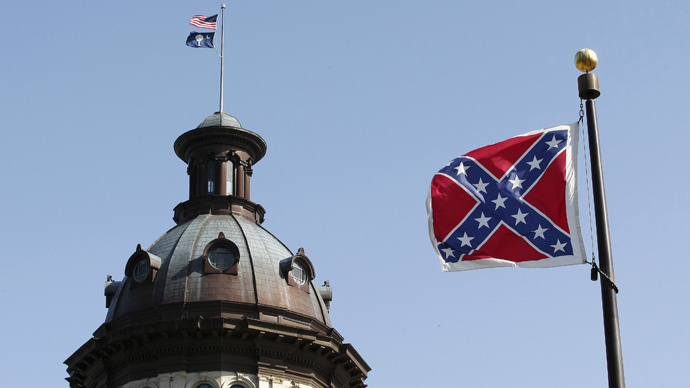 Activist Bree Newsome, however, said that just taking down the flag was not enough, and that the South had to repudiate white supremacy and what the Confederacy stood for. Newsome was arrested on June 27 for climbing up the flagpole and taking down the flag in a gesture of protest. If you're not going to repudiate what the Confederacy stood for or repudiate white supremacy, you're not really taking down the flag. The banner, originally used by the Confederate Army of Northern Virginia during the 1861-65 conflict which saw 11 Southern states attempting to separate from the US, was raised on top of the South Carolina statehouse in 1961 to mark the war’s centennial. In 2000, following a campaign by NAACP and other organizations, state legislators agreed to relocate the flag from the capitol dome to a 30-foot flagpole near the Confederate Soldier's Monument, on capitol grounds. Activists have campaigned against the flag for years, arguing it was a symbol of racism and oppression, but the public climate rapidly shifted following last month’s murder of nine black churchgoers in Charleston, SC. The shooter, 21-year-old Dylann Roof, reportedly said his act was racially motivated. When photos of Roof holding a Confederate flag emerged after his arrest, companies and governments across the US rushed to crack down on the banner. Retailers like eBay and Amazon have banned all merchandise featuring the flag, and Apple has gone so far as to ban Civil War video games that depicted it. A North Charleston police officer lost his job over a Facebook photo showing him dressed in flag-themed boxer shorts, while the vicar of the National Cathedral in Washington, DC, advocated taking out a stained-glass window commemorating Confederate Generals Lee and Jackson – and featuring the battle flag. Even an old television show ‘The Dukes of Hazzard’ was censored, because its protagonists drive a car called ‘General Lee’ with a Confederate battle flag painted on top. On Tuesday, the US House of Representatives voted to ban the display of Confederate flags at two federally-administered Civil War cemeteries. The proposal, sponsored by California Democrat Jared Huffman, called for the National Park Service to block private groups from using the flag to decorate the graves of Confederate soldiers at Andersonville, Georgia, and Vicksburg, Mississippi. Many Southerners, however, consider the flag a symbol of their history and heritage. Johnny Cooper of Alabama is carrying the banner on an 800-mile (1,287km) protest march from the state capital Montgomery to Washington, DC. Setting out on July 4, Cooper has already walked a quarter of the way.